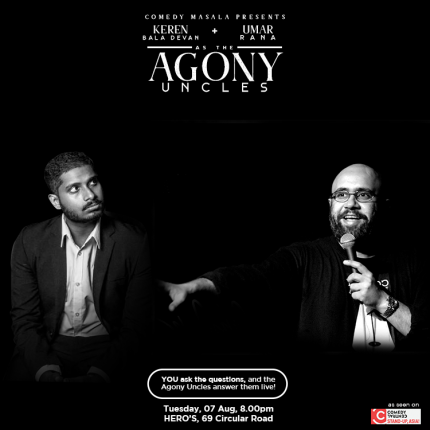 THE AGONY UNCLES makes its much-awaited return to Comedy Masala! Combining stand-up & improv. The Agony Uncles is a show that is NOT for the faint-hearted! Umar is the founder of Comedy Masala. In July 2016, Umar made his TV debut on “Comedy Central Asia presents Stand-up Asia!”, and in 2013 Umar was listed in the Top 10 comedians in Asia by Top 10 Magazine, Malaysia. Umar has been doing comedy since 2001, in both improv and stand-up. He was one of the founding members of Black Fish, Pakistan's first & highly acclaimed English-Speaking Improv Comedy Troupe. He's performed live in Singapore, New Zealand, Hong Kong, Malaysia, Sri Lanka, Indonesia & Pakistan. He was the official opening act for BILL BURR in Singapore, and has hosted and opened for Hollywood comedian Rob Schneider. Umar is also the Resident Host at Singapore's most popular weekly comedy night, Comedy Masala. Keren Bala Devan loves to share his unique views about everything wrong with modern culture. Usually by complaining. A lot. His specific brand of comedy stems from years of observing how ridiculous things that are part of everyday life have come to be. From strange modern cultural habits to the annoying behaviour of the general populace, he always find something to say and rant about. As part of the next generation of comics in Malaysia, his journey has lead to him headlining various venues around Kuala Lumpur and Petaling Jaya, opening for International comic Paul Ogata, and performing in shows with Harith Iskander as well as at the International Comedy Fringe Festival in Singapore.